Bridgeland's late model fleet consists of approximately 45 tractors, all of which are equipped with a communication system which provides data and GPS capabilities. Our Dispatch team maintains contact with all our drivers and can track your shipment at any time. Our trailer fleet consists of approximately 84 trailers. We haul a variety of tandem, tridem, 4, 5, and 6 axle configurations. The trailers consist largely of insulated stainless steel construction, built to MC307, MC407, MC312 and MC412 US-DOT codes. Bridgeland also operates 13 customer owned fiberglass trailers. Late model power units are replaced every five years, keeping our vehicles on the leading edge of technology and the most fuel efficient. Bridgeland's up to date tank trailer fleet is 100% air ride for more accurate axle weights and better drainability during off-loading. 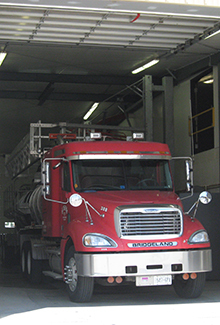 Located in Elmira, Ontario, our terminals is situated on a 5.9 acre site, with administration offices, 3 full maintenance bays, paved parking area and a double wash bay for tank inspections, exterior & interior cleaning. The terminal has fuel on site, an 80ft platform scale and a loaded trailer drop area. The drop area is complete with 2 150ft concrete dolly pads and a limestone containment area.